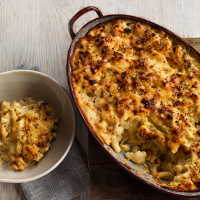 An amalgam of two comfort food classics. The pasta gives it the heft to serve as a main course, with just a green salad on the side. 1. Cook the cauliflower in boiling, salted water for 6-8 minutes, until just tender. Scoop it out and drain with a slotted spoon; set aside. 2. Put the macaroni in the same water; cook according to pack instructions, until just al dente. Drain and set aside. 3. In the same pan, fry the pancetta for about 7-9 minutes, until crispy. Remove and add to the cauliflower and pasta. 4. Melt the butter in the pan; add the flour. Stir for 1-2 minutes, until it starts to bubble. Gradually whisk in the milk until it forms a smooth sauce. Add the bay leaf; simmer over the lowest heat for 10 minutes, stirring often, until thick and smooth. 5. Preheat the oven to 200˚C, gas mark 6. Mix together the cheeses and stir all but a couple of handfuls into the white sauce. Add the nutmeg, then add the mustard, cayenne pepper and cream; season generously. Stir in the cauliflower, pasta and pancetta. Taste and add more seasoning and nutmeg, if needed. Pile into a gratin dish (about 1.5-2 litres in volume) and scatter with the reserved cheese. Bake for 20–25 minutes, or until bubbling and tinged with gold. This recipe was first published in Thu Jan 21 09:25:00 GMT 2016.